본 발명은 의학 진단 검정을 용이하게 하고 이러한 검정을 수행하는 데 소요되는 시간을 단축시키기 위한 방법, 장치 및 키트에 관한 것이다. The present invention relates to a method for shortening the time it takes to facilitate and make these black medical diagnostic assays, devices, and kits. 당해 방법은 반응을 개시하는 단계, 당해 반응과 관련된 관찰 대상의 값 또는 수준을 3개 이상의 상이한 시점에서 측정한 3개 이상의측정치를 수득하는 단계 및 이러한 측정으로부터 관찰 대상에 대한 반응 종료점 값을 추정하는 단계를 포함한다. The method for estimating a reaction end point value for the observation target from the phase and such a measurement initiating a reaction, obtaining at least three measured values ​​measured at different points in time the value or level of the observation target at least three related to the reaction and a step. 의학 진단 검정, 검정 시간 단축, 종료점, 관찰 대상, 키트. Medical diagnostic assays, test time reduction, endpoint, observe the target, Kit. 도 1은 1차 반응 속도를 갖는 반응을 나타낸 그래프로서, 세로축은 측정되거나 관찰된 분석물 농도이고, 가로축은 반응 시간을 나타낸다. 1 is a graph showing the response with a first-order reaction rate, and the vertical axis is the measured or observed analyte concentration and the horizontal axis represents the reaction time. 도 2는 1차 반응 속도를 갖는 반응에서 3지점 관찰 윈도우를 나타낸 그래프로서, 세로축은 측정되거나 관찰된 분석물 농도이고, 가로축은 반응 시간을 나타낸다. 2 is a graph showing a three point observation window in a reaction having a first reaction rate, and the vertical axis is the measured or observed analyte concentration and the horizontal axis represents the reaction time. 도 3은 본 발명에 따르는 반응 종료점 측정에 유용한 시스템을 도식적으로 도시한 도이다. 3 is a block diagram diagrammatically showing a system useful for reaction endpoint determination in accordance with the invention. 임상 화학 분야에서, 진단 검정은 분석물이 반응하여 반응에 여전히 존재하는 분석물의 양에 비례하는 비율로 관찰 가능한 생성물을 형성하는 화학 반응으로 종종 이루어진다. In clinical chemistry, diagnostic assays are often made up of the chemical reactions that form the observable product at a rate proportional to the amount of analyte still present in the reaction to the analyte reaction. 이는 1차 반응이라고도 하며, 여기서 생성물 형성 속도는 반응물, 즉 분석물의 1차 반응 차수에 비례한다. This is also referred to as the first reaction, in which product formation rate is proportional to the reaction, that is analytes first-order reaction. 1차 반응은, 반응 생성물의 농도에 비례하는 관찰 가능한 대응이 반응 시간 및 반응 속도 상수에 관련된 지수 등식에 의해 수학적으로 모델링된 지수 농도 대 시간 프로필을 생성한다. The primary reaction is carried out, it is observed to produce a mathematical exponential concentration vs. time profile modeled as the response by the exponential equation relating to the reaction time and the reaction rate constant as possible in proportion to the concentration of the reaction product. 관찰 가능한 대응은, 예를 들면, 반응물 또는 반응 생성물의 농도를 비색계 측정(colorimetric determination)할 수 있다. The observable response may be, for example, colorimetric, the concentration of reactants or the reaction product may be measured (colorimetric determination). 반응의 속도 상수는 전형적으로 온도에 따라 가변적이며, 통상 온도가 증가함에 따라 증가한다. The rate constant of the reaction is typically variable with temperature to be increased as the normal temperature increases. 반응 프로필이 완전히 1차가 아니라, 대부분의 반응 시간 과정에 걸쳐 1차 반응 속도 지수에 의해 근사되기에 충분한 정도로 근접하는 상황에 빈번하게 직면한다. The reaction profile is not completely car 1, frequently facing the situation in which a sufficient enough proximity to be approximated by a first-order reaction rate index throughout most of the reaction time course. 이는 종종 반응 속도(소정 온도하에서의 반응 속도)가 효소 및 분석물(반응물) 농도의 함수인 효소 촉매 반응의 경우에 해당한다. This is often the reaction rate (reaction rate under a predetermined temperature) in the case of an enzyme catalyzed reaction an enzyme and analyte (reactant) function of the concentration. 반응 종료점을 특성화하려면 통상 반응이 종결되어야 한다. The normal reaction should be terminated to characterize the reaction end point. 당해 반응은 온도나 효소 또는 기타 촉매 농도를 증가시킴으로써 가속되는 경우가 있을 수 있다. This reaction may be a case where the acceleration by increasing the temperature or enzyme or other catalyst concentration. 그러나, 대부분의 경우, 반응은 주변 온도에서 수행되어야 하며, 심지어 효소 또는 촉매 농도를 증가시키는 경우에도, 관찰 가능한 한계 대응에 도달하는 데 소요되는 시간은 긴 종료 시간을 요할 수 있다. In most cases, however, even if the reaction is to be carried out at ambient temperature, and, even increasing the enzyme or catalyst concentration, the time required to reach the limit observable response may require long shutdown times. 1차 또는 슈도-1차 반응 속도에 대한 다수의 의학 진단 시험은 주변 온도 조건하에 수행되는 종료점 검정을 기반으로 한다. A primary or a plurality of medical diagnostic tests for the pseudo-primary reaction rate is based on a black end point is carried out under ambient temperature conditions. 이러한 대부분의 검정은, 반응을 고려한 시간이 반응의 종료점과 관련된 관찰 가능한 대응에 대한 재현 가능한 값을 수득하기에 충분해야 할 필요가 있다. Most of this is black, it is necessary to time considering the response to be sufficient to obtain a reproducible value for an observable response associated with the end point of the reaction. 화학적 및 생화학적 화합물을 검출하기 위한 검정은, 반응 종료점을 지시하는 타당하고 정확하게 관찰된 대응 또는 값을 수득하는 데 수분 또는 수시간이 소요될 수 있다. Test for the detection of chemical and biochemical compounds may reasonably indicative of the reaction end point, and to obtain a corresponding value or observed accurately can take minutes or hours. 다수의 임상적 및 생화학적 검정에 대한 반응 종료점을 수득하는 데 필요한 대기 시간은 의학 실험의 생산성을 감소시키고 응급 상황에서 허용될 수 없는 긴 종료 시간을 지닐 수 있다. The waiting time to obtain a reaction endpoint for a number of clinical and biochemical assays can reduce the productivity of medical experiments and possess the long end time can not be allowed in emergency situations. 추가로, 당뇨병 환자에 대한 혈당치 시험 및 항응고 환자에 대한 트롬보플라스틴계 시험과 같이 다수의 통상적으로 사용되는 검정은, 비임상 설정하에 일반인에 의해 점점 더 많이 수행된다. In addition, a black to be used in a number of conventional steps thromboplastin-based tests for blood glucose testing and anticoagulant patients for diabetes, is more and more carried out by the public under non-clinical setting. 이러한 일반인에 의해 필요 시간 동안 측정하면서 기술 또는 인내심의 부족으로 시험 측정을 반복하는 불편이 요구될 수 있고, 잘못된 진단 데이터가 수득되는 위험도 증가될 수 있으며, 결국에는 부적절하게 수행된 시험 측정과 관련된 최적화되지 못한 임상 결과가 유도될 수 있다. As measured during the time required by these public and the inconvenience of repeating the test measurements to a lack of skills or patience may be required, may be increased risk of incorrect diagnosis data is obtained, and eventually optimize associated with improperly performed the test and measurement clinical results could not be induced. 따라서, 의학 진단 시험에서 전체 검정 시간을 단축시키고 이러한 시험을 용이하고 간단하게 수행하게 하는 방법이 요구된다. Therefore, a method that reduces the overall test time and easy and simple to perform these tests in medical diagnostic testing is required. 본 발명은 이러한 요구를 충족시킬 뿐만 아니라, 배경기술에서 밝혀진 결함도 대체로 극복할 수 있다. The present invention not only meets these needs, it is possible to overcome the defects found in the background art generally. 본 발명은 의학 진단 검정을 용이하게 하고 이러한 검정을 수행하는 데 소요되는 시간을 단축시키는 방법을 제공한다. The present invention provides a method of easily and reduce the time required to perform this test for medical diagnostic assays. 보다 구체적으로는, 본 발명은 반응 종료점의 계산 추정을 가능하게 하는 상이한 시간 간격으로 측정된 측정치로부터 1차 반응 속도 지수에 대한 해법을 측정하기 위한 방법을 제공한다. More particularly, the present invention provides a method for determining a solution to the first order rate index from the measured values ​​measured in different time intervals, which enables the estimation calculation of the reaction end point. 본 발명은 또한 상이한 시간 간격에서 측정된 측정치로부터 1차 반응을 근사하는 방법을 제공한다. The present invention also provides a method of approximating a first order reaction from measurements taken at different time intervals. 당해 방법은, 개략적으로, 반응을 개시하는 단계, 상기 반응을 지시하는 관찰 가능한 화학종과 관련된 값 또는 농도를 3개의 상이한 시점에서 측정한 3개 이상의 측정치를 수득하는 단계 및 상기 측정치로부터 관찰 가능한 화학종에 대한 종료점 값을 추정하는 단계를 포함한다. The process, schematically, the method comprising: initiating a reaction, to obtain three or more measurements a measure of the value or level associated with observable species indicative of the reaction at three different time points and chemical observable from the measurements and a step of estimating a end point value for the species. 당해 종료점 값은, 중간 측정치에서, 이전 측정치와 이후 측정치 간의 차이를 제곱한 값과 거의 동일한 수를 (이후 측정치 - 중간 측정치의 2배 + 초기 측정치)의 정수배와 거의 동일한 수로 나눈 값을 뺀 차이값에 따라 추정할 수 있다. Art end point value is in the middle of a measure, prior to measurement, and after approximately the same number to the value squaring the difference between the measured value - the difference value obtained by subtracting a value substantially divided by the same number with an integer multiple of (after measurement 2x + initial measure of the intermediate measurements) depending on can be estimated. 제한하고자 하는 것은 아니지만 예를 들자면, 당해 반응은 1차 또는 슈도-1차 거동 또는 특성을 갖는 어떠한 화학 반응, 생물학적 반응, 생리학적 반응 또는 기타 반응이라도 포함할 수 있다. Without wishing to be limited, but for example, the reaction may comprise any chemical reaction, biological reaction, physiological response, or other reaction having first order or pseudo-primary behavior or characteristic. 반응과 관련된 관찰 가능한 화학종은, 광학적, 전기학적, 분광학적, 방사선학적, 화학적이거나 기타 기술을 통해 검출 가능한 샘플 계측기, 샘플 판독기 또는 기타 검출 장치에 내장될 수 있는 분자(들), 또는 이와 관련된 표지(들)을 포함할 수 있다. Observable species associated with the reaction, optical, electrical chemical, spectroscopically, radiologically, chemically, or sample the instrument can be detected through other techniques, molecules which can be embedded in a sample reader or other detection device (s), or related It may include a cover (s). 관찰 가능한 화학종은 반응에서 검출 가능한 분석물 또는 반응물, 검출 가능한 반응 생성물, 또는 반응에는 참여하지 않지만 반응에서의 반응물 또는 분석물의 농도 또는 수준을 지시하는 검출 가능한 화학종, 화합물 또는 약품을 포함할 수 있다. Observable species are able to do not participate in detectable in the reaction analyte or reagent, a detectable reaction product, or a reaction including the reaction or analysis of a detectable species, compound or drug which indicates the concentration of water or level of the reaction have. 이러한 값의 측정은, 다수의 양태에서, 균등하거나 실질적으로 균등한 시간 간격 Δt에서 수득될 수 있다. Determination of these values ​​are, in many embodiments, can be obtained at equal or substantially equal time intervals Δt. 다른 양태에서, 상이한 시간 간격은 별개의 개별적인 측정일 수 있다. In another embodiment, different time intervals can be a separate individual measurements. 측정은 반응 전, 반응 후, 또는 반응 전후 모두 수행될 수 있다. Measurement can be performed both before and after the after reaction I, the reaction, or a reaction. 당해 방법은 측정값으로부터 반응에 대한 종료 시점을 측정하는 단계를 추가로 포함할 수 있다. The method may further comprise the step of measuring the end time for the reaction from the measured value. 본 발명의 방법은, 특정 양태에서, 수학식 1에 따르는 관계에 따라 반응의 진행 정도를 지시하는 관찰 가능한 화학종 A가 존재하는 반응을 개시하는 단계, 관찰 가능한 화학종에 대해 제1 측정치 A 1 , 제2 측정치 A 2 및 제3 측정치 A 3 을 측정하는 단계 및 관찰 가능한 화학종에 대한 최종 또는 종료점 값 A ∞ 를 측정하는 단계를 포함한다. The method of the present invention, in a particular aspect, the first measured value for initiating a reaction of the chemical species A observable indicative of progress of the reaction according to the relationship according to equation (1) is present, observable species A 1 , and a second measurement a 2 and the step of measuring a final or endpoint value a ∞ for the observable species, and step of measuring the three measurement a 3. 측정치 A 1 , A 2 및 A 3 에 대한 측정은 다수의 양태에서 균등하거나 실질적으로 균등한 시간 간격 Δt에서 이루어질 수 있으나, 특정 양태에서는 측정치 A 1 , A 2 및 A 3 에 대한 측정이 균등하지 않은 시간 간격에서 이루어질 수 있으며, 이러한 측정은 소정의 기간이 경과한 후 특정하게 이루어질 수 있다. Measurement A 1, A 2 and A measure for 3 can be made in a number of aspects equal or substantially equal time intervals in Δt. However, measurement A 1, A 2 and A 3 are the measurement is not equal to the specific embodiments may be made in the time interval, these measurements can be made specifically after a lapse of a predetermined period of time. 측정치 A 1 , A 2 및/또는 A 3 에 대한 측정은 일반적으로 반응의 개시후 임의 시점에서 수행되거나 개시될 수 있고, 종료점 값의 측정은 반응 개시 시간의 특성화 또는 지정을 요구하지 않는다. Measurement A 1, A 2 and / or measurement of the A 3 may generally be carried out after the start of the reaction, or started at any point in time, measurement of the end point value does not require characterization or designation of the start of the reaction time. 일부 양태에서, 측정치 A 1 , A 2 및 A 3 에 대한 측정은, 반응 개시 후 소정 시간이 경과한 후, 또는 이전의 측정(들)을 수행한 후 소정 시간이 경과한 후에 수행할 수 있다. In certain embodiments, the measurement of the measured values A 1, A 2 and A 3 may be carried out given after the time has elapsed, or after a predetermined time has passed after performing the previous measurement (s) after the start of the reaction. 본 발명의 방법은, 일부 양태에서, 제1 관찰 윈도우 동안 관찰 가능한 화학종에 대한 제1 세트의 A 1 , A 2 및 A 3 값을 측정하는 단계, 상기 수학식 1에 따라 제1 종료점 값 A ∞ 를 측정하는 단계, 후속 제2 관찰 윈도우 동안 관찰 가능한 화학종의 제2 세트의 A 1 , A 2 및 A 3 값을 측정하는 단계, 제2 종료점 값 A ∞ 를 측정하는 단계, 및 제1 종료점 값과 제2 종료점 값으로부터 종료점 값의 차 ΔA ∞ 를 측정하는 단계를 포함한다. The method of the present invention, in some embodiments, the first observation Observation of the first set A of the possible species 1, while window A 2 and A step of measuring a third value, the equation according to the first first end point value A measuring a ∞, the method comprising the subsequent second observation measuring step of measuring the a 1, a 2 and a 3 values of the second set of observable species during the window, the second end point value a ∞, and the first endpoint and a step of measuring the difference ΔA ∞ value of the end point from the value and the second end point value. 당해 방법은 n번째 관찰 윈도우 동안 관찰 가능한 화학종에 대한 제n 세트의 A 1 , A 2 및 A 3 값을 측정하는 단계, 제n 종료점 값 A ∞ 를 측정하는 단계, 제1, 제2 및 제n 세트의 값들로부터 ΔA ∞ 를 측정하는 단계, 및 관찰 가능한 화학종의 측정치 A 1 , A 2 및 A 3 을 측정하기 위한 관찰 윈도우 동안 반응 개시 후 시간 간격을 선택하는 단계를 추가로 포함할 수 있다. The method comprising: step, measuring the n-th end point value A ∞ to measure the A 1, A 2 and A 3 values of the n sets of the observable species during the n-th observation window, the first, second and from the values of n set may include a step of measuring the ΔA ∞, and further the step of selecting a time interval after the start of the reaction during the observation window for measuring the observed measurement of possible species a 1, a 2 and a 3 . 반응 동안 측정치 A 1 , A 2 및 A 3 세트의 측정은 해당 반응에 대한 "관찰 윈도우"로 간주될 수 있으며, 그 동안 측정치 A 1 , A 2 및 A 3 에 대한 3회 측정이 이루어진다. Measurements for reaction A 1, A 2 and A 3 of the measurement set may be considered an "observation window" for the reaction, is made three times measured for that measurement A 1, A 2 and A 3 during. 관찰 윈도우는 반응 개시에 대해 시간에 따라 이동 가능하며, 종료점 값 A ∞ 를 성공적으로 추정하기 위해 반복될 수 있다. Observation window, and for the start of the reaction to be movable with time, it can be repeated to successfully estimate of the endpoint value A ∞. 종료점 값 A ∞ 의 추정시 고유한 시스템 오차는 개별 측정 사이의 임의의 소정 시간 간격 Δt와 임의의 소정 반응 상수 k에 대한 A ∞ - A 2 의 일정한 %이다. A system-specific error estimation of the endpoint value A is A ∞ ∞ for any given time interval Δt and any given reaction constant k between individual measurements - a constant% of A 2. 바람직한 결과 A ∞ 의 %로서의 오차는 "3개의 관찰 윈도우"가 시간 경과에 따라 진행하면서 작아져서, 반응을 수행하면서 더 뒤로 갈수록 보다 정확한 추정치 A ∞ 가 유도된다. Preferred% error as a result of A ∞ "The three observation window" becomes smaller and the progress over time, while performing the reaction further back toward a more accurate estimate A ∞ is derived. 따라서, 종료점 값 A ∞ 의 추정시의 오차%는 측정치 A 1 , A 2 및 A 3 사이의 시간 간격 Δt, 반응의 완료도 및 반응 상수 k의 함수이다. Thus, the end point of the estimation error% of the value A ∞ is a function of the measured values A 1, A 2, and the time interval between A 3 Δt, the completion of the reaction and also the reaction constant k. 추정치 A ∞ 의 오차가 진짜 또는 실제 값의 허용 가능한 범위 내에 있도록 하려면, 측정하기 전에 반응이 특정한 종결도 이하로 진행되도록 하고/하거나 측정된 값 A t 를 종료점 값 A ∞ 의 추정치와 비교하여 관찰된 반응 상수에 대한 측정 사이의 시간 간격 Δt를 최적화하고/하거나 반응을 수행하는 동안의 온도를 관찰하고 온도와 반응 상수 k 사이의 공지된 관계를 적용함으로써 상기 파라미터들을 조정할 수 있다. By the error of the estimate A ∞ compared with the estimate of the real or to be within an acceptable range of the actual value, an that the reaction proceeds with no less certain termination and / or measured values A t prior to the measurement end point value A ∞ Observed by optimizing the time interval Δt between the measurement of the rate constants, and / or observing the temperature during the reaction and applying a known relationship between temperature and reaction constant k can adjust the parameters. 보다 고온에서(보다 높은 k 값), Δt는 관찰 가능한 화학종의 측정값 A에 대한 시간 곡선에서의 보다 큰 곡률을 보상하기 위해 더 작을 수 있는 반면, 보다 낮은 k 값에서, 일련의 A 값 사이의 차이가 작아서 무작위 오차의 존재하에 신호 대 노이즈 비가 불량해질 수 있다. At a higher temperature (than the high-k), Δt is observed, while further be smaller to compensate for greater curvature in a time curve for measured values ​​A of possible species, than in the low k, between the series of value of A that can be made small, the signal-to-noise ratio is poor in the presence of random error difference. 따라서, 다수의 양태에서, 시간 간격 Δt는 소정의 반응상수 k에서 목적하는 최소한의 종결도에서 허용가능한 오차의 한계 내에서 가능한 커야한다. Thus, in many embodiments, the time interval Δt must be as large as possible within the limits of allowable error in the least termination also desired at a given reaction constant k.
배경 노이즈는 반응과 관련된 관찰 가능한 화학종의 값을 측정하기 위한 다수의 검출 시스템에서 중요한 인자이다. Background noise is an important factor in many detection systems for measuring values ​​of observable species associated with the reaction. 따라서, 본 발명의 일부 양태에서는, 측정 동안 존재하는 신호 대 노이즈 비 뿐만 아니라 반응 종결도를 지시하는 수렴치를 점검하기 위해 다수의 일련의 종료점 값 A ∞ 의 추정치를 검사하는 것이 바람직할 수 있다. Thus, in some aspects of the invention, it may be desirable to test an estimate of the signal-to-noise ratio as well as the completion of the reaction, a series of multiple end points to check convergence value indicative of the value A ∞ that are present during the measurement. 또한, 시스템 오차가 일정한 지수 함수이므로, 시간 경과에 따른 추정치 변화 자체는 이에 대한 지수이고, 종료점 값의 추정치를 또한 예측하여 시스템 오차를 추가로 감소시킬 수 있다. In addition, since the system error constant power function, estimate its change over time is the index for this, it is possible to further reduce the error in the system to also predict the estimate of the endpoint value. 본 발명의 방법은 의학, 생물학 또는 기타 검정의 종료점 측정에 필요한 전체 검정 시간을 단축시킨다. The method of the present invention shortens the overall test time needed for endpoint determination in medical, biological or other black. 검정에 대한 시간 단축 요구는 사용자에게 보다 큰 편의를 유도하며, 의학 실험 인원 및 자원을 보다 효율적으로 사용할 수 있게 한다. Shorten the time required for the test shall derive great convenience to users, it allows the use of medical experiments personnel and resources more efficiently. 본 발명은 또한 로그 또는 지수를 사용하지 않는 지수 반응의 종료점의 추정을 가능하게 하여, 종료점 추정에 요구되는 계산이 계측기 또는 판독기에서 입수할 수 있는 것과 같은 저전력 마이크로프로세서 및 "개인용 디지탈 보조기" 또는 PDA 장치와 같은 포켓형 데이터 프로세서로 용이하게 수행될 수 있다. The present invention also provides a low power processor and the "personal digital assistants", such as in the calculation which allows for the estimation of the end point of the exponential response are not using the log or index, required for end point estimation can be obtained from the instrumentation or reader or PDA a data processor, such as a pocket-sized device can be easily performed. 본 발명은 추가로, 검정 반응의 정밀한 개시 시간을 몰라도 종료점을 추정할 수 있게 한다. The present invention further, without knowing the precise starting time of the black reaction makes it possible to estimate an end point. 본 발명은, 예를 들면, 치료학적 약물에 대한 환자의 노출 및 당해 약물의 흡수를 측정하는 단계, 개인에게 존재하는 비독성물의 농도를 측정하는 단계 및 샘플 내의 유해한 약품의 존재 여부를 검출하는 단계를 포함하는 무수한 진단 시험에 사용할 수 있다. The invention, for example, a therapeutic drug and measuring the absorption of the exposure and the art medication on a patient, the method comprising: measuring the concentration of a non-toxic Dangerous present in the individual and detecting the presence of hazardous chemicals in the sample It can be used in a myriad of diagnostic testing that includes. 본 발명의 방법은, 환자 또는 일반인에 의해 '해당 분야' 또는 임상적 설정의 외부에서 통상적으로 수행되는 혈당치 모니터링 및 항응고제 요법 모니터링과 같은 의학 진단 시험에 특히 유용하다. The method of the present invention is particularly useful in medical diagnostic tests, such as a patient or a blood glucose monitoring and monitoring anticoagulation therapy is typically performed outside of 'the art, or the clinical setting by a general public. 본 발명의 이러한 목적 및 이점과 기타 목적 및 이점은 후술되는 상세한 설명으로부터 명백할 것이다. These objects and advantages and other objects and advantages of the invention will be apparent from the following detailed description. 본 발명은 단지 예시용으로 주어진 도면을 참고로 하여 보다 상세하게 이해될 것이다. The invention will be understood in more detail by the drawings given only for illustrative purposes by reference. 본원의 모든 정의는 명확성을 위해 제공되며, 제한을 가하는 것으로 간주되어서는 안된다. All definitions of the present application are provided for the sake of clarity, and should not be considered to apply a limit. 본원에서 사용된 기술적 및 과학적 용어는 본 발명이 속하는 분야에서 통상적인 기술을 가진 자에 의해 일반적으로 이해되는 바와 동일한 의미를 갖는다. The technical and scientific terms used herein have the same meaning as commonly understood by those of ordinary skill in the art to which this invention belongs. 본원에서 사용되는 "1차 반응"이라는 용어는 1차 또는 슈도-1차 반응 속도를 나타내거나 1차 반응 속도에 근사함으로써 적절하게 특성화될 수 있는 모든 화학적, 전기화학적, 생화학적 또는 기타 반응을 의미한다. The term "primary reaction" as used herein is a primary or pseudo-primary reaction rate indicate the primary or any chemical, electrochemical, which can be properly characterized by approximation to the reaction rate, meaning the biochemical or other reaction do. 본원에 사용되는 "프로트롬빈 시간" 또는 "PT" 및 문법적으로 이에 상응하는 용어는, 과도한 응혈(혈전)의 위험이 있는 개인의 치료를 모니터링하는 데 사용 가능한 혈액 응고 시간에 대한 시험을 의미한다. The "prothrombin time" or "PT" and grammatical As used herein, this term corresponds to the means for testing for blood coagulation time available to monitor the treatment of at risk of excessive blood clot (thrombus) individuals. 본원에서 사용되는 "눈금 코드" 및 문법적으로 이에 상응하는 용어는 상업적인 다수의 진단 검정 및/또는 이의 구성분을 표준화하는 데 사용되는 독특한 수 또는 수의 세트를 의미한다. A "grid code" and grammatical As used herein, this corresponds to the term refers to a unique number or set of which is used to standardize a number of commercial diagnostic assays and / or its constituents. 본원에서 사용되는 "혈장" 및 문법적으로 이에 상응하는 용어는, 혈액의 혈장, 즉 혈액 세포가 현탁되는 무세포 유체를 의미한다. A "plasma" as used herein and the grammatical equivalent of the term, the blood plasma of the blood, that means a cell-free fluid is a blood cell suspension. 본원에서 사용되는 "숙주", "환자", "개인" 및 "피검자" 및 문법적으로 이에 상응하는 용어는 반응의 관찰 가능한 특징에 대한 종료점 값을 추정하기 위한 본 발명의 방법을 사용하거나 이의 사용을 요하는 임의의 포유동물 또는 비포유 동물의 구성원(들)을 의미한다. Herein a "host," "patient", "individual" and "subject" and grammatical used as an equivalent term that uses the inventive method for estimating the end point values ​​for observable features of reaction or counter used in the It refers to a member of any mammalian or non-mammalian that require (s). 본 명세서 및 첨부된 특허청구의 범위에서 사용되는 용어가 단수로 사용되는 경우에도 별도의 명백한 언급의 없는 한 복수의 의미도 포함하는 것으로 이해해야 한다. This even if the specification and terms that are used in the scope of the appended claims to be used in the singular should be understood to include a plurality of means, unless a separate explicit mention. 따라서, 예를 들면, "대조용 혼합물"이라는 용어는 하나 이상의 대조용 혼합물을 의미하며, "응고 시험"은 하나 이상의 응고 시험을 의미한다. Thus, for example, the "to-be-verified mixture" the term means a mixture of one or more to-be-verified, and "coagulation test" means one or more coagulation test. 화학적 및 생물학적 검정 또는 유사 반응의 경우, 분석물은 전형적으로, 반응 용기에 그대로 존재하는 분석물의 양에 비례하는 관찰 가능한 화학종의 농도 또는 값을 변화시키는 방식으로 반응한다. For chemical and biological black or similar reaction, an analyte is typically reacted in such a way as to change the concentration or the value of the observable species that is proportional to the amount of analyte present in the same reaction vessel. 관찰 가능한 화학종은 반응 동안 농도가 감소하는 분석물 자체, 분석물이 고갈됨에 따라 증가하는 반응 생성물, 또는 반응에 실제적으로 참여하지는 않지만 반응의 진행을 지시하는 또 다른 화학종을 포함할 수 있다. The observable species may be but not actually involved in the reaction product, or reaction that increases as the analyte itself, an analyte which concentration decreases during the reaction run out include another chemical species indicative of the progress of the reaction. 1차 반응의 경우, 분석물은 반응에 잔류하는 분석물의 양에 비례하는 속도로 관찰 가능한 방식으로 반응한다. 1 for the primary reaction, the analyte reacts in an observable manner at a rate that is proportional to the amount of analyte remaining in the reaction. 이러한 화학적 반응의 대응을 모니터링하면서, 시간 경과에 따른 반응의 대응 또는 진행은 지수적이며, 농도(관찰 가능한 화학종의 농도) 대 시간의 함수로서, 반응 생성물의 생성이 모니터링되는 상황에 대해서 수학식 2a로 나타내거나, 반응물의 소멸이 모니터링되는 상황에 대해서 수학식 2b로 나타낸다. While monitoring the response of such a chemical reaction, response or progress of the reaction over time is an exponential, and the concentration (concentration of observable species) as a function of vs. time, the equation for a situation in which the generation of reaction product monitored represented by 2a, or, with respect to the situation in which the disappearance of the reaction was monitored represented by equation 2b. A 0 는 반응을 개시하기 전에 관찰 가능한 대응값이다. A 0 is a possible corresponding value observed prior to the start of the reaction. 반응물의 소멸을 수반하는 또 다른 가능한 상황은 수학식 2c로 나타낼 수 있을 것이다. Another possible situation involving the disappearance of reactant would be represented by the equation 2c. 수학식 2a는 일반적으로, 관찰 가능한 반응 생성물이 반응 개시시 전혀 존재하지 않는 상황에 관한 것이며, A ∞ 로서 검출되는 이의 최종 농도는 진단 방법에서 정량화되는 분석물(출발 물질)의 양에 관한 것이다. Equation 2a is a general, the observable reaction product towards a situation does not exist at all at the start of reaction, a final concentration thereof is detected as A ∞ is related to the amount of analyte (starting material) being quantitated in the diagnostic method. 수학식 2b는 검출 가능한 출발 물질이 분석물과 반응하여 검출이 불가능한 생성물을 형성하는 상황에 관한 것이다. Equation 2b is a detectable starting material relates to a situation of forming a non-product is detected by reacting with the analyte. 검출 가능한 출발 물질이 과량으로 존재하고, 최초의 검출 가능한 대응값(A 0 )과 최종 검출 가능한 대응값(A ∞ ) 사이의 차이는 존재하는 분석물의 양에 관한 것이다. The detectable starting material is present in an excess amount, and between the first detection potential corresponding to the value (A 0) and the final detectable response value (A ∞) the difference is related to the presence of both analytes. 수학식 2c는 검출 가능한 대응값이 분석물 자체인 상황에 관한 것이며, 반응이 종결되는 경우 대응값은 0이 된다. Equation 2c is related to the corresponding value is a detectable analyte itself situation, the corresponding value when the reaction was completed, the reaction is zero. 본 발명은 수학식 2a 및 2b와 관련된다. The present invention is related to the equation 2a and 2b. 파라미터 k는 반응의 속도 상수이며, 전형적으로 온도에 따라 가변적이며, 통상 온도 증가에 따라 증가한다. The parameter k is the rate constant of the reaction is typically variable with temperature, the increase in a usual temperature increase. 관찰 가능한 대응값은, 예를 들면, 시약, 반응 종료 생성물, 또는 반응에 존재하는 기타 화합물 또는 종과 관련된 검출 가능한 색상을 포함할 수 있다. Observed corresponding value is available, for example, can include a detectable color associated with any other compound or species present in the reagent, a reaction end product, or the reaction. 혈당치 모니터링 및 응고방지 치료요법의 치료제 농도를 모니터링하는 데 사용되는 것과 같은 다수의 중요한 검정은 종료점 값 A ∞ 의 측정을 필요로 한다. Number of important test as it is used to monitor the concentration of therapeutic agent in blood glucose level monitoring and coagulation preventing treatment regimen requires a measurement of the end point value A ∞. 많은 경우, 추정치 A ∞ 를 수득하기 위해 반응이 필수적으로 종결될 때까지 실제로 대기하는 것이 불편하다. In many cases, to actually wait until the reaction is essentially concluded in order to obtain an estimate A ∞ is inconvenient. 일부 경우, 반응 곡선은 예상대로 위의 수학식 2의 1차 반응 속도 지수적 수학적 유형을 준수하며, 적절한 추정치 A ∞ 를 수득하기 위해 반응이 종료될 동안 대기하지 않고 다수의 시점에서 A를 측정한 후 당해 수학식 2의 파라미터(k 및 A ∞ )를 구할 수 있다. In some cases, the response curve rather than waiting for to be in compliance with the first reaction rate exponential mathematical type of the equation (2) above, as expected, the end of the reaction in order to obtain a proper estimate A ∞ a measure of the A in the plurality of point after the art can obtain the parameters (k and a ∞) of equation (2). 그러나, 중요한 의학 및 생물학적 검정에 수반되는 다수의 반응은 1차 반응 거동을 따르지 않아서, 적정한 추정치 A ∞ 가 용이하게 수득될 수 없다. However, an important medicine and a plurality of reaction involved in the biological assay did not follow first order reaction behavior, it is not reasonable estimate A ∞ can be easily obtained. 또한, 미분에 의해 파라미터 k 및 A ∞ 에 대한 수치 평가를 수행할 수 있다. 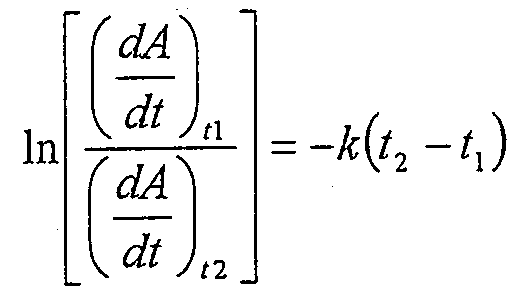 Further, it is possible to perform the evaluation value for the parameters k and A ∞ by the differential. 그러나, 이러한 접근법은 계산 집약적이며, 메모리가 제한되고 마이크로프로세서 주기가 긴 통상적인 측정 장치에 그다지 적합하지 않다. However, this approach is computationally intensive, the memory is limited and microprocessor cycle are not very suitable for long conventional measuring apparatus. 본 발명은 다수의 생물학 및 의학적 검정에서 사용될 수 있는 관찰 가능한 화학종료점 값 A ∞ 을 추정하기 위한 신속하고 용이하며 정확한 방법을 제공할 뿐만 아니라, 당해 방법을 수행하기 위한 수단 및 키트를 제공한다. The invention not only provides a large number of biological and fast, easy and accurate method for a medical test to estimate the observable end point value A ∞ chemical that can be used in, and provides a means and a kit for performing the method. 당해 방법은 반응의 진행 정도를 지시하는 관찰 가능한 화학종 A가 존재하는 반응을 개시하는 단계, 관찰 가능한 화학종에 대해 제1 시점 t 1 , 제2 시점 t 2 및 제3 시점 t 3 에서 제1 측정치 A 1 , 제2 측정치 A 2 및 제3 측정치 A 3 을 측정하는 단계 및 측정치 A 1 , A 2 및 A 3 으로부터 수학식 1에 따라 관찰 가능한 화학종의 종료점 값 A ∞ 를 측정하는 단계를 포함한다. The method first time point t 1, the second time point t 2 and the third at a first time t 3 for initiating the reaction for the observable species A, which indicate the progress of the reaction is present, observable species measurement a 1, a second measurement a 2 and claim comprising the step, and measurement a 1, a 2, and measuring the end point value a ∞ of the observable species according to equation (1) from a 3 for measuring the three measurement a 3 do. 이다. to be. 측정치 A 1 , A 2 및/또는 A 3 에 대한 측정이 추가로 후술되는 바와 같이 반응의 개시후 소정의 시간이 경과한 후 수행될 수 있기는 하지만, 측정치 A 1 , A 2 및 A 3 에 대한 측정이 일반적으로 반응 개시 후 임의의 시간에 이루어지거나 개시될 수 있다. Measurement A 1, A 2 and / or A after the start of the reaction, as will be described later in more measured for 3 can be carried out after a predetermined time has elapsed, however, for the measured values A 1, A 2 and A 3 after the start of measurement is generally the reaction can be initiated or performed at any time. Δt의 값이 수반되는 특정 반응에 따라 선택될 수 있다. Can be selected according to the particular reaction involved, the value of Δt. 상이한 온도에서 ( 및 후술되는 바와 같이 상이한 k 수치에서) 관심을 끄는 반응의 연구를 수행한다. At different temperatures (and at different k values ​​as discussed below) and performs the reaction of research interest. 이러한 방식으로, 반응이 특정 온도에서 또는 특정한 온도 범위 내에서 수행되는 경우, 반응 시간을 충분한 정도로 단축시킬 수 있는 반면(즉, 좀 더 빨라진 종료점), 종료점 값 A ∞ 에서 허용 가능한 정확도를 유지한다. In this way, if the reaction is carried out within a specific temperature or a specific temperature range, while capable of reducing the reaction time to a sufficient degree (that is, the more faster the end point), and maintains an acceptable accuracy in the end point value A ∞. 이러한 정확도는 반응 프로필에서 곡률의 양에 대해 지나치게 큰 Δt를 가짐으로써 저하될 수 있다. This accuracy can be degraded by having the excessively large Δt relative to the amount of curvature in the reaction profile. 각각의 온도 또는 k에 대해 최적인 fΔt 값을 측정하기 위해 상이한 온도에서 해당 반응을 연구하는 데에 표 또는 기타 수학식을 사용하여, 반응의 수행시 종료점 측정에 사용되는 데이터 스트림을 처리하기 위한 최적의 Δt를 선택할 수 있다. Using a table, or any other formula in to study the reactions at different temperatures to determine the most suitable fΔt value for each temperature or k, the optimum for processing a data stream that is used to perform when endpoint determination of the reaction in which you can select the Δt. 온도가 (온도 감지기, 온도계 또는 기타 수단을 통해) 측정되거나 k의 초기 추정치가 임의의 작은 Δt를 사용함으로써 수득되어, 초기 데이터를 처리하고 하기 수학식 20을 사용하여 k 값을 근사할 수 있다. The temperature is measured (via temperature sensor, thermometer or other means) or the initial estimate of k are obtained by using an arbitrarily small Δt, and may for processing the initial data using Equation (20) to approximate the value of k.
의 경우, 반응 상수 k 및 종료점 값 A ∞ 의 측정은 보다 복잡하다. 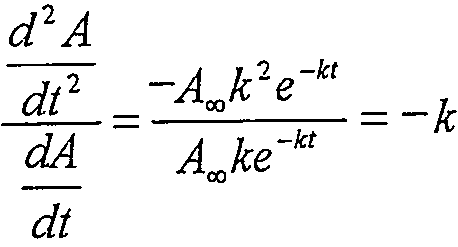 For the measurement of the reaction constant k and end point value A ∞ it is more complex. 종료점에서의 관찰 가능한 값 A ∞ 을 정확하게 측정하기 위해 수학식 1의 연산 효율은 다음과 같이 나타날 수 있다. Operation efficiency of the formula (1) in order to accurately measure the observable value, A ∞ at the end point may appear as follows: 우선, 미분 등식인 수학식 3을 고려한다. First, consider the differential equation in Equation (3). 2개의 시점 t 1 및 t 2 에서 측정된 A 대 t의 기울기에 대해, 수학식 4의 관계식이 수득된다. 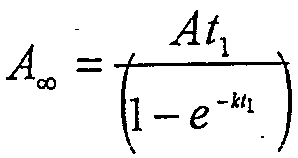 For the inclination of the two time t 1 and the A versus t measured at t 2, to give a relationship of Equation (4). 수학식 4는 수학식 5에 의해 보다 단순하게 나타낼 수 있다. Equation 4 may be represented more simply by the equation (5). 수학식 5는 반응 상수 k를 구하기 위해 수학식 6으로서 나타낼 수 있다. Equation 5 can be expressed as Equation (6) to obtain the rate constant k.
수학식 6을 수학식 2a로 대체하면 수학식 7이 수득된다. Substitution of equation (6) by the following formula 2a is obtained the equation (7). 수학식 7에 따라 A ∞ 를 측정하기 위해, A t 에 대한 값을 최소한 3회 측정해야 한다. To measure ∞ A according to Equation 7, the value for A t should be measured at least three times. 로그 및 지수 산정이 둘 다 사용될 수 있으며, 해법은 계산 집약적이어서, 임상 검정에서 통상적으로 사용되는 저전력 마이크로프로세서에서의 편리함보다 시간 및 계산기 사용이 더 많이 요구된다. The log can be used, and the two index calculation, and the solution is computationally intensive then the typically more convenient to use time and the converter in the low-power microprocessors commonly used in clinical test are more demanding. 그러나, 추가의 단계를 밟아서 수학식 8에 제시된 2차 미분을 계산하면, 상황이 보다 단순해진다. However, when stepped on the further step of calculating the second derivative shown in equation (8), it is simpler situation. 수학식 8의 2차 미분을 1차 미분 dA/dt로 나누면, 반응 상수 k가 구해지는 수학식 9가 수득된다. 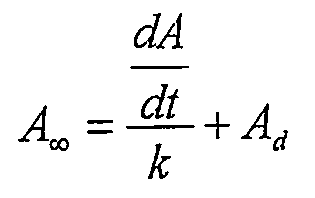 Dividing the second derivative of equation (8) to the first derivative dA / dt, the equation (9) the reaction constant k which is obtained is obtained. 도 1의 그래프는 측정된 값 A 대 시간의 지수 반응 곡선을 도시한 것이다. The graph of Figure 1 illustrates an exponential reaction curve of measured value A versus time. 도 1은, 가정용 진단 검정이 환자에 의해 수행되는 경우 빈번한 바와 같이, 해당 반응의 개시 시간을 모르는 상황, 즉 t 0 가 미지인 상황을 예시한다. 1 is a frequent, as the case for home diagnostic test is performed by the patient, it does not know the start time of the reaction illustrated the situation, that is, t 0 is unknown situations. 관찰 가능한 값 A d 의 1차 측정은 시간 t d 에서 이루어지며, 이는 미지의 반응 개시시간 t 0 이후에 수행된다. Observable primary measured value of A d are made at time t d, which is performed after the reaction start time t 0 of the unknown. 수학식 2a의 관계식은 수학식 10으로 나타낼 수 있다. Relational expression of equation 2a can be represented by the equation (10). 수학식 10의 미분은 수학식 11로 나타낼 수 있으며, 수학식 11은 수학식 12로 나타낼 수 있다. The derivative of equation (10) can be expressed by Equation 11, Equation 11 can be expressed by equation (12). t=t d 인 경우, 수학식 12는 수학식 13으로 단순화될 수 있다. For t = d t, Equation 12 may be simplified to equation (13). 수학식 13으로부터, 종료점 값 A ∞ 를 계산하는 데 필요한 것이, A 대 시간의 반응 곡선을 따라 한 개의 시점에서의 1차 미분 및 2차 미분 뿐임을 알 수 있다. From equation (13), the end point is necessary to calculate the value A ∞, A vs. time response curve of the first derivative and second derivative point only in accordance with the it can be seen that. 도 2를 보면, 각각 시점 t 1 , t 2 및 t 3 에서 측정된 값 A 1 , A 2 및 A 3 에 상응하는 곡선상의 3개의 지점 P 1 , P 2 및 P 3 을 갖는 반응 곡선이 그래프에 의해 도시되어 있다. The Figure 2 look at, each of the time t 1, t 2, and the values A 1, A 2 and A 3 3 of the point P 1, the response curve is a graph with P 2 and P 3 on the curve corresponding to the measured at t 3 by is shown. 예시용으로, 1차 미분 및 2차 미분이 지점 P 2 에 할당되는 것으로 추정한다. It estimates that for example, the first derivative and the second derivative is assigned to the point P 2. 지점 P 1 및 P 2 사이의 곡선상의 중간에 위치한 지점(도시되지 않음)에서의 1차 미분인, 도 2의 곡선의 기울기 S 1 은 수학식 14로 나타낼 수 있다. It points P 1 and P 2 located in the midway point on the curve (not shown) between the first derivative of, the slope S 1 of the curve of Figure 2 in can be expressed by equation (14). 마찬가지로, 지점 P 2 및 P 3 사이의 곡선상의 중간에 위치한 지점(도시되지 않음)에서의 1차 미분인, 도 2의 곡선의 기울기 S 2 는 수학식 15로 나타낼 수 있다. Similarly, the point P 2, and P the point on the curve in the middle between the third (not shown), the first derivative, the gradient S 2 of the curve of Figure 2 in can be expressed by equation (15). P 2 에 할당된 1차 미분의 평균치인 S 3 은 수학식 16으로 나타낼 수 있으며, P 2 에 할당된 2차 미분 S'는 수학식 17로 나타낼 수 있다. S 3 is the average value of the first derivative is assigned to P 2 is a second order derivative may be represented by equation (16), assigned to P 2 S 'can be expressed by Equation (17). 수학식 9로부터 반응상수 k를 추정하면 수학식 18이 제공되며, 수학식 13으로부터 A ∞ 를 추정하면 수학식 19가 제공된다. When estimating the reaction constant k from equation (9) is provided with Equation (18), when the A ∞ estimates from equation (13) is provided with an equation (19). 측정치 A 1 , A 2 및 A 3 의 견지에서 A ∞ 를 구하면 수학식 1이 수득되며, 이는 본 발명에 따르는 반응 종료점을 특성화하는 데 사용될 수 있다. Obtaining a A ∞ in the light of measured values A 1, A 2 and A 3 is obtained the equation (1), which can be used for characterizing a reaction end point according to the invention. 유사한 방식으로, k의 근사화가 수학식 20으로서 유도될 수 있다. In a similar manner, an approximation of k can be derived as Equation (20). 상술한 기울기 산정의 유한성으로 인해 수학식 1의 근사에 있어 고유한 오차가 어느 정도 존재함을 유의해야 한다. Due to the finiteness of the above-described slope calculation it should be noted that the error inherent in the approximation of equation (1) exists to some extent. 따라서, 반응 진행 또는 종결을 나타내는 관찰 가능한 양 A인, 종료점 값 A ∞ 의 추정은, 관찰 가능한 화학종 A를 수반하는 반응을 개시하는 단계, 관찰 가능한 화학종에 대해 제1 측정치 A 1 , 제2 측정치 A 2 및 제3 측정치 A 3 을 측정하는 단계 및 수학식 1에 따라 관찰 가능한 화학종의 종료점 값 A ∞ 를 측정하는 단계를 포함한다. Therefore, the amount A observable indicating the reaction progress or concluded, the estimation of the endpoint value A ∞ is the first measurement A 1, a second for initiating a reaction involving a chemical species A observable, observable species 2 and the measure a and a step of measuring the end point value a ∞ of the observable species according to equation (1) and step of measuring the three measurement a 3. 3개의 연속 측정치 A 1 , A 2 및 A 3 은 시간 경과에 따라 이동하여 A ∞ 의 연속 추정치를 제공할 수 있는 "3개의 관찰 윈도우"로서 간주될 수 있다. Three consecutive measurement A 1, A 2 and A 3 may be thought of as a "three observation window" that can provide a continuous estimate of the A ∞ moves with the lapse of time. 추정치에서의 고유한 시스템 오차는 Δt = t 1 - t 2 = t 2 - t 3 와 k의 소정치에 대해 A ∞ - A 2 의 일정 %이므로, 목적하는 결과 A ∞ 의 %로서의 오차는 "3개의 관찰 윈도우"가 시간 경과(반응 종료점을 향한 시간 경과)에 따라 진행되면서 점점 작아져서, 반응이 진행될수록 A ∞ 를 보다 정확하게 추정할 수 있다. Inherent systematic error in the estimate is Δt = t 1 - t 2 = t 2 - t 3 and A ∞ for the predetermined value of k - because a certain% of A 2, the error as an objective result% of A ∞ that is "3 so getting smaller as proceeding in accordance with the observation window of the "time elapsed (time towards the reaction end point), the reaction can be more accurately estimate the progress slows a ∞. 따라서, 오차%는 Δt, 반응 종결도 및 k의 함수이다. Thus, the% error is a function of Δt, and the completion of the reaction is also k.
A ∞ 의 추정치 오차가 실제 값의 목적하는 분율보다 작게 하기 위해, 관찰된 k(이는 수학식 20에 따라 추정 가능하다)에 대해 Δt를 최적화하면서 측정치 A t 를 A ∞ 의 추정치와 비교하고/하거나 온도를 관찰하고 온도와 반응상수 k 사이의 공지된 관계를 적용함으로써 반응이 특정한 반응 종결도를 넘어 진행되도록 이들 파라미터를 고정시킬 수 있다. In order to estimate the error of the A ∞ is smaller than a target fraction of the real value, the observed k compares the measured values A t while optimizing Δt on (This is possible estimated according to Equation (20)) and the estimate of A ∞ and / or by observing temperature and applying a known relationship between temperature and reaction constant k can be reacted fixed the parameters to proceed beyond a certain degree of the reaction. 전형적인 화학 반응의 경우, 비교적 높은 온도에서는 k가 증가하여, Δt가 보다 큰 곡률에 대해 보상하기 위해 작아져야 하는 반면, 비교적 낮은 온도에서는 k가 낮아서, A t 의 연속 값 사이의 차이가 작기 때문에 불규칙한 장치상의 오차 또는 기타 오차의 존재하에 신호 대 노이즈의 비가 불량해질 수 있다. For typical chemical reactions, at a relatively high temperature, k is increased, whereas Δt is be smaller to compensate for greater curvature, a relatively low temperature in the irregular because k is less the difference between the low, successive values of A t can be made in the presence of an error or other variations in device of the signal-to-noise ratio is poor. 따라서, Δt는 바람직하게는 목적하는 최소한의 종결도에서 허용 가능한 오차의 한계 내에서 소정의 k에서 가능한 한 커야 한다. 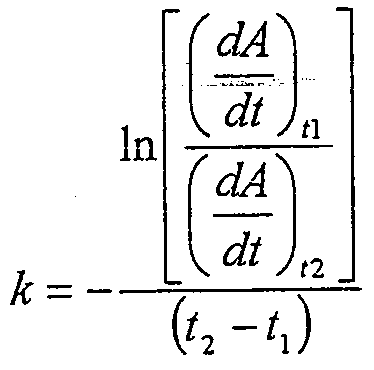 Therefore, Δt may be as large as possible at a given k, within the limits of allowable error in the least termination diagram Preferably purpose. 배경 노이즈가 본 발명을 사용하는 다수의 상황하에서 중요할 수 있으므로, 반응 종결도와 신호 대 노이즈 둘 다를 지시하는 수렴치를 점검하여 A ∞ 의 연속 추정치를 검사하는 것이 바람직할 수 있다. Since background noise may be important under a number of conditions using the present invention, the check value converges indicating both the reaction terminator to assist signal to noise may be desirable to examine successive estimates of A ∞. 이와 관련하여, 본 발명의 방법은 제1 관찰 윈도우 동안 관찰 가능한 화학종에 대해 제1 세트의 A 1 , A 2 및 A 3 값을 측정하고 제1 종료점 값 A ∞ 을 수학식 1의 관계에 따라 측정하고, 제2의 후속 관찰 윈도우 동안 관찰 가능한 화학종의 제2 세트의 A 1 , A 2 및 A 3 값을 측정한 다음, 제2 종료점 값 A ∞ 을 측정하고 제1 종료점 값과 제2 종료점 값으로부터 종료점 값의 차이 Δ A ∞ 를 측정함으로써 이러한 연속 추정치를 제공한다. In this regard, the method of the present invention According to measure the A 1, A 2 and A 3 values of the first set and the first end point value A ∞ for the observable species during one observation window in the relationship of equation (1) measurement, measurement of the a 1, a 2 and a 3 values of a second set of observable species during a subsequent observation window, and then, the second end point value a ∞ the measure and a first end point value a and the second endpoint by measuring the difference in end point value from a value Δ a ∞ it provides such a continuous estimate. 당해 방법은, 제3 관찰 윈도우 동안 제3 세트의 A 1 , A 2 및 A 3 값을 측정하고 n번째 관찰 윈도우 동안 제3 세트의 A 1 , A 2 및 A 3 값을 측정한 다음, n번째 종료점 값 A ∞ 을 측정하고 이들 값의 제1, 제2, 제3 및 제n 세트로부터 ΔA ∞ 를 측정하는 단계를 추가로 포함할 수도 있다. The method, the third observation of measuring the A 1, A 2 and A 3 values of the third set for the window and measuring the A 1, A 2 and A 3 values of the third set for the n-th observation window, and then, the n-th measuring the end point value a ∞ and the value of these first, second, and may further comprise a step of measuring the ΔA ∞ from the third and the n-th set. 측정치 A 1 , A 2 및 A 3 을 측정하기 위한 관찰 윈도우 동안 반응을 개시한 후 최소한의 시간 간격 또는 최적의 시간 간격의 선정은, A ∞ 의 연속 추정치들을 비교하고 상이한 관찰 윈도우로부터의 A ∞ 에 대한 측정치의 수렴치를 관찰함으로써 측정될 수 있다. The A ∞ from the measured values A 1, A minimum time interval or a selection of the optimal time interval, comparing the successive estimates of A ∞ and different observation window after starting the reaction during the observation window to 2, and measuring the A 3 by observing the convergence value of measurement it can be measured. 추가로, 시스템 오차는 일정한 지수 함수이므로, 시간 경과에 따른 추정치 변화 자체는 이에 대한 지수이고, 종료점 값 A ∞ 의 추정치를 또한 예측하여 시스템 오차를 추가로 감소시킬 수도 있다. In addition, the systematic error is a constant because it is an exponential function, estimate changes over time itself may be decreased by adding an index, a system error to also predict the estimate of the endpoint value A ∞ for this. 본 발명은, 반응 종료점의 계산 추정을 가능하게 하는, 상이한 시간 간격에서 이루어진 측정으로부터, 의학 진단 검정을 용이하게 하고 이러한 검정에 사용되는 시간을 단축시키는 방법을 제공한다. The present invention, from the calculated estimated possibly measurements made at different time intervals, to the end point of the reaction, facilitating medical diagnostic assays and provides a method of reducing the time used for this assay. 당해 방법은, 개략적으로, 반응을 개시하는 단계, 상기 반응을 나타내는 관찰 가능한 화학종과 관련된 값을 3개의 상이한 시점에서 3회 이상 측정한 값을 수득하는 단계 및 상기 측정치로부터 관찰 가능한 화학종에 대한 종료점 값을 추정하는 단계를 포함한다. The process, schematically, the method comprising: initiating a reaction, of a value associated with observable species indicative of the reaction in three different observable chemical from step and the measurement value for obtaining the values ​​measured three times or more at the time of species and a step of estimating a end point value. 당해 종료점 값은, 중간 측정치에서, 이전 측정치와 이후 측정치 간의 차이를 제곱한 값과 거의 동일한 수를 (이후 측정치 - 중간 측정치의 2배 + 초기 측정치)의 정수배와 거의 동일한 수로 나눈 값을 뺀 차이에 따라 추정할 수 있다. The difference obtained by subtracting the value substantially divided by the same number with an integer multiple of (twice + the initial measurement value of the intermediate measurement since the measured value) art end point value is in the middle of a measure, prior to measurement with almost the same number with a value squared differences between subsequent measurement depending can be estimated. 보다 구체적으로, 본 발명의 방법은, 관찰 가능한 화학종 A가 반응의 진행 정도를 지시하는 반응을 개시하는 단계, 관찰 가능한 화학종에 대해 제1 측정치 A 1 , 제2 측정치 A 2 및 제3 측정치 A 3 을 측정하는 단계 및 수학식 1에 따라 관찰 가능한 화학종의 종료점 값 A ∞ 를 측정하는 단계를 포함한다. More particularly, the method of the present invention is observable species A, the first measurement A 1, a second measurement A 2 and the third measurement value for initiating a reaction indicative of the progress of the reaction, the observable species according to step 1) and (a 3 for measuring a step for measuring the end point value a ∞ of the observable species. 측정치 A 1 , A 2 및 A 3 에 대한 측정은 이하 실시예에 제시한 바와 같이 다수의 양태에서 균등하거나 실질적으로 균등한 시간 간격 Δt에서 이루어질 수 있다. Measurement A 1, A 2 and A 3 for the measurement can be made in uniform in a number of aspects or substantially equal time intervals Δt, as shown in the following Examples. 측정치 A 1 , A 2 및/또는 A 3 에 대한 측정은 일반적으로 반응의 개시후 임의 시점에서 수행되거나 개시될 수 있고, 일부 양태에서, 측정치 A 1 , A 2 및 A 3 에 대한 측정은, 반응 개시 후 소정 시간이 경과한 후, 또는 미리 측정(들)을 한 후 소정 시간이 경과한 후에 수행할 수 있다. Measurement A 1, A 2 and / or A measurement of the three generally after the start of the reaction can be carried out or initiated at any time, in some embodiments, the measurement of the measured values A 1, A 2 and A 3, and the reaction after a predetermined time has elapsed after the start, or after a pre-measurement (s) may be carried out after a predetermined time has elapsed. 본 발명의 방법은 모든 화학 반응, 생물학적 반응, 생리학적 반응 또는 기타 반응을 포함할 수 있다. The method of the present invention may include all chemical reaction, biological reaction, physiological response, or other reaction. 반응과 관련된 관찰 가능한 화학종은, 광학적, 전기학적, 분광학적, 방사선학적, 화학적이거나 기타 기술을 통해 검출 가능한 분자(들), 또는 이와 관련된 표지(들)을 포함할 수 있다. Observable species associated with the reaction, and can include optical, electrical chemical, spectroscopically, radiologically, chemically, or the detectable molecule (s) through other techniques, or associated cover (s). 본 발명의 방법은 특히 샘플 계측기, 샘플 판독기 또는 계산력이 한정된 기타 검출 장치로 사용하기에 매우 적합하다. The method of the present invention is well suited for use as the other detection device especially limited sample meter, sample reader or computing power. 관찰 가능한 화학종은 반응에서 검출 가능한 분석물 또는 반응물, 검출 가능한 반응 생성물, 또는 반응에는 참여하지 않지만 반응에서의 반응물 또는 분석물의 농도 또는 수준을 지시하는 검출 가능한 화학종, 화합물 또는 약품을 포함할 수 있다. Observable species are able to do not participate in detectable in the reaction analyte or reagent, a detectable reaction product, or a reaction including the reaction or analysis of a detectable species, compound or drug which indicates the concentration of water or level of the reaction have. 하기 특정 실시예는 광학적으로 검출 가능한 화합물을 사용한다. To a specific embodiment uses a possible optically detected compound. 많은 경우, 포켓형 장치로 수행되는 진단 검정 반응은, 목적 분석물에 특이적인 색 형성 시약 시스템으로 함침된 시험 패드 또는 스트립과 같은 고체 지지체를 사용한다. In many cases, the reaction is carried out in diagnostic assays handheld devices, it uses a solid support such as a test pad or strip impregnated with a color forming reagent system specific to an analyte object. 전형적인 분석물은 글루코스, 콜레스테롤 및 우레아 등이다. Typical analytes are glucose, cholesterol, urea, and the like. 이러한 진단 검정에 통상적으로 수반되는 다수의 기타 분석물은 당해 분야의 숙련가들에게 용이하게 제안될 것이다. A number of other analytes typically accompanied by such diagnostic assays will be readily suggested to those skilled in the art. 색 형성 시약 시스템은 목적 분석물과의 1차 반응을 선택적으로 촉매하는 효소 또는 기타 촉매를 포함할 수 있다. Color forming reagent system may include an enzyme or other catalyst, which selectively catalyzes a primary reaction with the analyte purpose. 1차 반응의 생성물은 반응 영역에서 검출 가능한 색상 변화와 같은 광학적으로 검출 가능한 변화를 겪는 염료 또는 기타 화합물일 수 있다. The primary product of the reaction may be a dye or other compound undergoes an optically detectable change, such as a possible color change is detected in the reaction zone. 다른 양태에서, 1차 반응의 생성물은 또 다른 반응을 겪는, 효소 촉매화될 수 있고 최종 염료가 반응 영역에서 검출 가능한 색상변화를 직접 또는 간접적으로 겪도록 하는 2차 반응에 참여할 수 있는 중간체일 수 있다. In another embodiment, the product of the first reaction is further reacted undergo, may be enzyme catalyzed, and the final dyes may be capable of participating in a secondary reaction to undergo a possible change in color is detected in the reaction zone, either directly or indirectly, intermediate have. 본 발명에서 사용 가능한 색 형성 시약 시스템의 예는 글루코스에 특이적이고 글루코스 옥시다제, 퍼옥시다제 및 산화 가능한 염료를 함유하는 시스템이다. Examples of the color forming reagent system usable in the present invention is a system containing a specific and glucose oxidase, peroxidase and an oxidizable dye to glucose. 글루코스 옥시다제는, 글루코스 및 산소와 반응하여 글루코노락톤 및 과산화수소를 생성시키는, 아스페르길루스 니거(Aspergillus Niger) 또는 페니실리움(Penicillium)으로부터 수득한 효소이다. Glucose oxidase is an enzyme obtained from glucose and reacts with oxygen to produce gluconolactone and hydrogen peroxide, Aspergillus nigeo (Aspergillus Niger) or penny room Solarium (Penicillium). 이와 같이 생성되어 양고추냉이 퍼옥시다제와 같은 퍼옥시다제 효소에 의해 촉매된 과산화수소는 염료를 산화시킨다. Thus it is produced the amount of chilli peppers by the oxidase enzyme catalyst, such as hydrogen peroxide and horseradish peroxidase oxidizes a dye. 생성된 발색단(산화된 염료)은 반응 영역에서 관찰될 수 있는 색상을 나타낸다. The resulting chromophore (the oxidized dye) indicate the color that may be observed at the reaction zone. 따라서, 이러한 양태에서 관찰 가능한 값은 반응 영역에서 존재하는 염료의 농도를 비색계 측정하는 단계를 포함할 것이다. Therefore, the observable values ​​in such embodiments would include the step of measuring the concentration of a colorimetric dye present in the reaction zone. 예를 들면, 본원에 참조로 인용된 미국 특허 제5,304,468호에 제시된 것을 포함하는 글루코스 검정용으로 사용하기에 적합한 다수의 산화 가능한 염료가 당해 분야에 공지되어 있다. For example, there are a number of possible oxidation dye suitable for use for the glucose assay involves set forth in U.S. Patent No. 5,304,468 incorporated by reference herein, known in the art. 또 다른 특히 유용한 산화 가능한 염료는, 본원에 참조 인용되어 있는 미국 특허 제6,218,571호에 기재되어 있는 3-메틸-2-벤조티아졸리논 하이드라존 하이드로클로라이드/8-아닐리노 1-나프탈렌설포네이트 염료 시스템(MBTH/ANS)이다. Another particularly useful oxidizable dye is 3-methyl-2-benzothiazolinone hydrazone hydrochloride / 8-anilino-1-naphthalene sulfonate dye described in U.S. Patent No. 6,218,571 the disclosure of which is incorporated herein by reference a system (MBTH / ANS). 선호되는 또 다른 염료쌍은 MBTH 유도체, 메타-3-메틸-2-벤조티아졸리논 하이드라존, ANS와 커플링된 N-설포닐 벤젠설포네이트 모노나트륨이다. Another dye couple that is preferred is the MBTH derivatives, meta-3-methyl-2-benzothiazolinone hydrazone, ANS coupled with N- sulfonyl benzenesulfonate monosodium. 이러한 조합은 본원에 참조 인용된 1994년 9월 8일자로 출원된 미국 특허원 제08/302,575호에 상세하게 기술되어 있다. This combination is described in detail in U.S. Patent Application No. 08/302 575, filed on September 1994, see the cited 8 date herein. 반응을 광학적으로 특성화하는 기타 적합한 염료 및 염료 시스템이 당해 분야의 숙련가에게 제안될 수 있다. Other suitable dyes and dye systems for optically characterizing the reaction the art may be suggested to one skilled in the art. 혈당치 측정에 통상적으로 사용되는 것과 같은 시험 스트립 및 광학 판독기 시스템에 산화 가능한 염료가 사용될 수 있다. The test strip and oxidation dye as possible to the optical reader system such as that commonly used in blood glucose measurement may be used. 예를 들면, 미국 특허 제6,268,162호는 다공성 시험 스트립으로부터 판독된 반사도를 기준으로 하여 체액 중의 분석물 농도를 측정하는 시스템을 기술하고 있으며, 당해 문헌은 본원에 참조 인용되어 있다. For example, U.S. Patent No. 6,268,162 is the basis of the read-out reflectance from the porous test strip describes a system for measuring analyte concentration in the body fluid, the art document is incorporated herein by reference. 이러한 시스템에서, 체액 샘플을 시험 스트립에 적용한 다음, 당해 스트립을 광학 판독기 또는 계측기 속에 삽입한다. In such a system, applying the fluid sample to the test strip is inserted, and then, the strip in the art optical reader or meter. 이러한 경우의 측정치 A는 시험 스트립으로부터 측정된 반사도 값이고, 반응 종료점에 상응하는 반사도 값은 본 발명에 따라 측정된 반사도 값으로부터 산정될 수 있다. A measured value of this case is the reflectance measurements from the test strip, the reflectivity values ​​corresponding to the reaction end point can be estimated from the measured reflectance values ​​in accordance with the present invention. 본 발명에 따르는 종료점 추정을 위한 값의 측정도 전기화학적 검정을 기본으로 할 수 있다. Determination of values ​​for end point estimation in accordance with the invention can also be an electrochemical test basis. 이러한 검정은 일정 간격으로 이격된 전극이 내장되어 있는 전지 속에서 시험 샘플을 사용할 수 있다. This assay can be used to test a sample in the cell, which built-in electrodes spaced at a predetermined interval. 따라서, 측정치 A는 전위 측정치를 포함하며, 이는 전극을 가로지르는 종료점 전위 값을 산정하는 데 사용된다. Thus, the measurement A comprises a potential measurement, which is used to calculate an end point potential value across the electrodes. 이러한 시스템은 본원에 참조 인용되는 미국 특허 제6,193,873호에 기술되어 있다. Such a system is described in U.S. Patent No. 6,193,873 which is incorporated herein by reference. 본 발명은 또한 프로트롬빈 시간 또는 PT 검정과 같은 혈액 응고 검정의 종료점 특성화에 사용될 수도 있다. The invention may also be used for end point characterization of blood coagulation tests such as prothrombin time or PT test. 이러한 검정은, 스트립 판독기를 사용하여 응고를 광학적으로 모니터링(광학적 투광율 또는 반사도를 통해 모니터링)하는 과정과 병행해서, 트롬보플라스틴을 함유하는 시험 스트립에 혈액 샘플을 적용함으로써 수행될 수 있다. This assay may be performed in parallel with the process of the optical coagulation using a strip reader to monitor (monitored by optical tugwangyul or reflectance), by applying the blood sample to the test strip containing thromboplastin. 이러한 시스템은 본원에 참조 인용된 유럽 특허원 EP 제0 974 840호에 기재되어 있다. Such a system is described herein, the European Patent Application No. EP 0 974 840 incorporated by reference. 이러한 유형의 시험 스트립은 미국 캘리포니아주 밀피타스 소재의 라이프스캔 인코포레이티드(Lifescan Inc.)로부터 HARMONY™ 시험 스트립으로서 시판중이며, 당해 스트립용의 상응하는 광학 판독기도 시판중이다. Test strips of this type are further available as HARMONY ™ Test Strips from LifeScan is sited Ray Inc. of Milpitas, Calif material (Lifescan Inc.), it is also commercially available corresponding optical reader for the art of the strip. 본 발명은 또한 진단 검정에 유용한 장치 및 시스템을 제공한다. The invention also provides devices and systems useful in diagnostic assays. 당해 장치는, 예를 들면, 반응과 관련된 관찰 가능한 지시물의 측정치 A의 판독, 입력 또는 기타 기입을 가능하게 하는 인터페이스, 및 수학식 1에 기재되고 상기 논의된 연산을 사용하여 기입된 값을 사용할 수 있게 하는 로직(logic) 요소(들)를 갖는 데이터 처리 장치를 포함할 수 있다. The apparatus is, for example, can read out the available water measurement instruction A observations relating to the reaction, and described in the interface, and Equation (1) to enable the input or other written using the values ​​entered using the above discussed operations a logic (logic) element (s) that enables may include a data processing apparatus having. 당해 장치는 A 값의 측정 사이의 시간 간격을 측정하도록 하는 시간 유지 소자를 추가로 포함하여, 당해 값이 상술한 바와 같이 소정의 시간 간격으로 측정될 수 있도록 할 수 있다. The apparatus may further include a timekeeping device that to measure the time interval between the measurement of the value A, so that, as the value of the art described above can be measured at a predetermined time interval. 인터페이스는 사용자가 키패드 또는 기타 편리한 수단을 통해 측정치 A를 기입하도록 하는 사용자 인터페이스를 포함할 수 있다. Interface may include a user interface that allows users to enter the measurement value A through the keypad or other convenient means. 당해 인터페이스는 A 값을 직접 측정할 수 있게 하는 인터페이스를 추가로 포함하거나, 이러한 인터페이스를 기존의 것 대신 포함할 수 있다. Art interface may further comprise an interface which enables to measure the A value, or directly, such interfaces include, instead of conventional. 이러한 인터페이스는, 예를 들면, 시험 스트립 또는 기타 샘플로부터 비색계 측정에 의해 A 값을 측정하는 광학적 판독기, 샘플 속의 전기용량에 따라 A를 측정하기 위한 회로 또는 본 발명에 따르는 측정치를 획득할 수 있도록 하는 기타 인터페이스를 포함할 수 있다. This interface, for example, that allows to obtain an optical reader, measured according to the A circuit or the invention for measuring according to the sample in the capacitance of measuring the A value by the colorimetric measurements from test strips or other sample Others may include interface. 이러한 인터페이스를 갖는 예시된 샘플 판독기가 상술되어 있다. The illustrated sample readers having such interfaces are described. 본 발명의 장치의 로직은 하드웨어, 소프트웨어 또는 이들 둘 다에 내장될 수 있다. Logic of the apparatus of the present invention may be embedded in hardware, software or both. 본 발명에 따르는 종료점 특성화은 상술한 바와 같은 로그 또는 지수 특성화을 필요로 하지 않으므로, 당해 장치에 요구되는 데이터 처리 용량은 적고, 비교적 단순한 샘플 판독기에 내장될 수 있다. Does not in the present invention an end point teukseonghwaeun log or index needed teukseonghwaeul as described above according to, low data processing capacity required for the apparatus can be built in a relatively simple sample readers. 예를 들면, 로직은 다수의 측정치를 판독 또는 입력하고 측정치에 대한 수학식 1의 연산에 적용하며 및 입력된 측정치에 따르는 하나 이상의 종료점 추정치를 출력하도록 배열될 수 있다. For example, the logic may be configured to output one or more end point estimation in accordance with the read or input a plurality of measured values ​​is applicable to the calculation of equation (1) for the measurement value and measurement value, and input. 로직은 샘플로부터의 값 측정을 선택적으로 시간 배정하고 수렴치에 도달할 때까지 연속적 종료점 추정치를 비교하도록 추가로 배열될 수 있다. Logic may be arranged additionally to compare the successive end point estimation until the time selectively assigned a value measured from the sample and reach the convergence value. 도 3에는, 본 발명에 따르는 반응 종료점 측정에 사용될 수 있는 장치 또는 시스템(10)이 도시되어 있다. 3, there is a device or system 10 that can be used for reaction endpoint determination in accordance with the present invention. 당해 시스템(10)은 개인용 디지탈 보조기 또는 "PDA"와 같은 포켓형 컴퓨터를 포함할 수 있다. Art The system 10 may comprise a handheld computer such as a personal digital assistant, or "PDA". 다른 양태에서, 데이터 처리 장치는 미니컴퓨터, 마이크로컴퓨터, PC[예: INTEL®계 프로세싱 컴퓨터 또는 이의 클론, APPLE® 컴퓨터 또는 이의 클론, SUN® 웍스테이션] 등의 컴퓨터를 포함할 수 있다. In another aspect, the data processing device a mini-computer, a microcomputer, PC: may include a computer such as EXAMPLE INTEL® based processing computer or clone thereof, APPLE® computer or clone thereof, SUN® workstation. 당해 시스템(10)은 당해 양태에서 중앙 처리 유닛 또는 CPU(14)에 접속하여 작동하는 키패드(12)로서 나타낸 사용자 인터페이스 소자를 포함한다. The art system 10 includes a user interface elements shown as buttons (12) that serves to connect the central processing unit or CPU (14) in this embodiment. CPU(14)는 어드레스 및 데이터 버스(16) 및 제어/상태 신호 인터페이스(18)을 통해 시스템(10)의 부품에 접속되어 작동한다. The CPU (14) is operatively connected to a part of the system 10 via address and data bus 16 and control / status signal interface 18. 이들 부품은 특히 DRAM 1차 또는 주요 메모리, 하나 이상의 SRAM 완충제, 및 ROM, PROM, EPROM, EEPROM 등의 형태인 하나 이상의 판독 메모리 소자와 같은 다양한 메모리 소자(도시되지 않음)을 포함할 수 있는 시스템 메모리(20)를 포함한다. These parts are especially DRAM 1 primary or main memory, one or more SRAM buffers, and ROM, PROM, various memory elements, such as one or more read the memory element in the form of an EPROM, EEPROM, etc., which may include (not shown) of system memory and a 20. 시스템(10)은 또한 샘플 속의 분석물 농도를 측정 또는 검출할 수 있게 하는 샘플 판독기(22)를 포함할 수도 있다. The system 10 may also include a sample reader 22 that can measure or detect the analyte concentration in the sample. 시스템(10)은 CRT, LCD 또는 기타 형태의 디스플레이와 같은 디스플레이 소자(24), 및 시스템(24)가 외부 데이터 프로세서, 샘플 판독기 또는 기타 외부 장치(도시되지 않음)와 인접하도록 하는 인터페이스 어뎁터(26)를 추가로 포함할 수 있다. The system 10 interface adapter (26 to so as to be adjacent to the display element 24, and a system 24 for an external data processors, sample readers or other external devices (not shown) such as a display of a CRT, LCD or other form ) may further comprise a. 인터페이스 어댑터(26)는 GPIB, RS-232, PCI, USB, SCSI, ETHERNET®, FIREWIRE® 또는 기타 IEEE 1394 인터페이스의 형태일 수 있다. Interface adapter 26 may be a GPIB, RS-232, PCI, USB, SCSI, ETHERNET®, FIREWIRE® or other form of the IEEE 1394 interface. CPU(14), 메모리(20), 샘플 판독기(22), 디스플레이(24) 및 인터페이스 어댑터(26)는 통상적인 방식으로 모판(도시되지 않음)을 통해 연관될 수 있으며, 그 위에 어드레스 및 데이터 버스(16) 및 제어/처리 인터페이스(18)에 의해 접속된다. CPU (14), memory 20, sample reader 22, display 24 and interface adapter 26 are bed in a conventional manner may be associated with a (not shown), the above address and data bus 16 and are connected by a control / processing interface 18. 시스템(10)은 하드 디스크 드라이브, 플로피 디스크 드라이브, NIC, CD 드라이브 및/또는 기타 통상적인 하드웨어 소자와 같은 다양한 추가 부품(이 또한 도시되지 않음)을 포함할 수 있다. The system 10 may include various additional components such as a hard disk drive, floppy disk drive, NIC, CD drive, and / or other conventional hardware elements (also not shown). 시스템 메모리(20)는 일반적으로, 어드레스/데이터 버스(16) 및 제어/상태 신호 인터페이스(18)을 통해 메모리(20) 및 CPU(14)에 연결되어 작동하는 다양한 하드웨어 부품의 작동에 적합한 작동 시스템 및 소프트웨어(도시되지 않음)를 함유할 것이다. System memory 20 is typically an address / data bus 16 and control / status signal interface 18 through memory 20 and is connected to the CPU (14) suitable for operating the system in the operation of the various hardware components that work and it will contain the software (not shown). 메모리(20)는 또한 반응의 진행에 대한 관찰 가능한 지시물과 관련된 수치를 3개의 상이한 시점에서 3회 이상 측정한 값을 입력 또는 수용할 수 있는 저장된 프로그램(28) 및 상술한 바와 같은 측정으로부터 관찰 가능한 지시물에 대한 종료점 값을 측정할 수 있는 저장된 프로그램(30)을 포함한다. Memory 20 is also observed from the measurements of the value associated with observable referent to the progress of the reaction of three of at least three times the value measured at different time points as a type or capable of receiving a stored program (28) and above It includes a stored program (30) that can measure the end point value for the possible referent. 적합한 방법을 실시하는 데 유용한 키트가 제공된다. Useful kit is provided to carry out the appropriate way. 본 발명의 키트는, 예를 들면, 분석물(들)을 함유하는 시험 스트립 또는 기타 샘플 홀더, 및 시험 스트립으로부터 다수의 측정치를 판독 또는 입력하도록 배열된 로직을 함유하는 시험 스트립을 판독하기 위한 샘플 판독기 또는 계측기를 포함할 수 있으며, 측정된 값에 수학식 1의 연산을 적용하고, 입력된 측정치에 따라 하나 이상의 종료점 추정치를 출력한다. The kit of the present invention, for example, the sample for reading the test strip containing the array of logic to read or input a plurality of measurements from test strips or other sample holders, and a test strip containing the analyte (s) It may include a reader, or the instrument, and applying the calculation of the equation (1) to the measured value, and outputs one or more end point estimation in accordance with the input measured values. 당해 키트는 체액을 시험 스트립에 적용하기 위한 인쇄된 지침, 및 시험 스트립으로부터 값을 측정하기 위한 판독기 또는 계측기의 용도를 포함한다. Art kit comprises a reader or meter for measuring values ​​from the use of the guidelines, and test printing strip for applying a body fluid to the test strip. 다음 실시예를 통해, 본 발명이 어떻게 구성되고 사용되는 지에 대한 완벽한 기술 및 설명이 당해 분야에서 통상의 기술을 가진 이에게 제공되나, 당해 실시예가 본 발명자가 본 발명으로서 간주하는 바의 범주를 제한하거나 실험이 수행된 전부 또는 유일한 실험을 나타내는 것으로 의도하지는 않는다. Through the following examples, but offered to this a perfect technique and a description of how to which the present invention is how to configure and use of ordinary skill in the art, limiting the art embodiment scope of the bar by the present inventors regarded as the invention or it not intended to represent all or the only experiments performed experiments. 사용되는 숫자에 대해 정확성을 보장하려는 시도가 이루어졌으나, 일부 실험 오차 및 편차가 고려되어야 한다. The attempt to guarantee the accuracy of the numbers used been made, it should be considered that some experimental error and deviation. 별도의 언급이 없는 한, 부는 중량부이고, 분자량은 중량 평균 분자량이 며, 온도는 ℃이고, 압력은 대기압 부근이다. And unless otherwise stated, parts are parts by weight, molecular weight is weight average molecular weight is said, the temperature is ℃, the pressure is near atmospheric pressure. 다음 실시예는, 피검자의 혈당 수준을 측정하기 위한 본 발명의 방법의 유용성을 설명하며, 재현 가능한 결과를 수득하는 데 필요한 전체 검정 시간(종료 시간)을 통상적인 종료점 분석 방법과 비교한다. The following examples, describe the usefulness of the method of the invention for measuring the glucose level of the subject, and to compare the overall test time (end time) is required to obtain reproducible results with conventional end point analysis methods. 당해 실시예에서, 글루코스 모니터 "SureStep®"를 사용하여, 본 발명의 연산법을 사용하여 소요되는 검정 시간을 피검자의 글루코스 수치를 측정하는 통상적인 방법과 비교한다. In this example, using a glucose monitor "SureStep®", and compares the test time by using the calculation method of the present invention and the conventional method of measuring a patient's glucose levels. SureStep®은 미국 캘리포니아주 밀피타스 소재의 라이프스캔, 인코포레이티드로부터 시판중인 혈당치 측정 시스템이다. SureStep® is a blood glucose measuring system is commercially available from LifeScan of Milpitas, California Tasman material, Inc.. 이는 포켓형 반사도 계측기 및 효소 촉매된 비색계 약품(글루코스 옥시다제 및 퍼옥시다제에 의해 촉매화된, MBTH 및 ANS의 유도체)을 사용하는 시약 스트립을 포함한다. This includes the reagent strip using a handheld reflectance meter and a colorimetric enzyme drugs catalyst (glucose oxidase and peroxidase catalyzed, derivatives of MBTH and ANS by). 당해 약품은, 스트립이 사용되는 경우 혈액 샘플을 흡수하는 다공성 폴리설폰 막 매트릭스 속에 분산된다. Art drugs, porous polysulfone film is dispersed in a matrix which absorbs the blood sample when the strip is used. 당해 계측기는 반응 매트릭스를 피크 파장이 660 내지 940nm인 LED로 조명한다. Art instrument is illuminated by a reaction of a matrix, the peak wavelength of 660 to 940nm LED. 660nm LED는 샘플 속의 글루코스의 양에 비례하는 비색계 반응의 생성물을 검출하는데 사용한다. 660nm LED is used to detect the product of a colorimetric reaction, which is proportional to the amount of glucose in the sample. 당해 계측기는 스트립을 1초 간격으로 반사도 측정한 다음, 수학식 21에 나타낸 바와 같이 반사도를 정량 K/S로 전환시킨다. Art instrument is converted to a reflectivity measurement of a strip at one-second intervals, then the reflectivity as shown in Equation (21) with the metering K / S.
R은 반응 매트릭스로부터 산란된 광량을 이를 조명하는 광량으로 나눈 비에 비례하는 양이다. R is an amount that is proportional to the ratio obtained by dividing the amount of light scattered from the reaction matrix by the amount of light illuminating it. K/S는 흡광 종(예: 염료)에 대략적으로 비례하는 양으로서 당해 분야에 공지되어 있다. K / S is a light absorbing species: is known in the art as the amount to roughly proportional to the (for example, dyes). 당해 계측기는 1초 660nm K/S 데이터(K/S 660 )를 수집하고, 일정 시점에서 1초 윈도우에 앞서 5초 윈도우로 당해 데이터를 처리한다. The art instruments are treated one second 660nm K / S data (K / S 660) for collecting and, before a second window, at some point the art, in 5-second window data. 각각의 5초 윈도우에 대해, 기울기(단위 시간당 K/S 변화)를, 현재 K/S 값과 5초 먼저 수득한 K/S 값 사이의 변화를 기준으로 하여 산정한다. For each 5 seconds the window, the slope (in K / S change per hour), and calculated by the change between the current K / S value and 5 seconds prior to the obtained K / S value as a guide. 반응이 기울기가 5초당 1% 미만인 지점까지 느려지는 경우, 종료점에 도달한 것으로 간주한다. If the reaction is slow, the slope is up to 5 points lower than 1% per second will be considered to have reached the ending point. 글루코스는 다음 수학식 22에 따르는 최종 K/S로부터 산정한다. 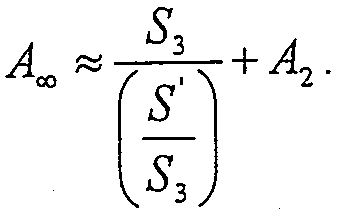 Glucose is calculated from the final K / S according to the following equation (22). 당해 실시예에서, 660nm로부터 반사도로부터 산정한 K/S 데이터는 15 내지 35℃의 온도 범위에서 SureStep®에 대해 1초 간격으로 수집한다. In this example, a K / S data calculated from the reflectance from 660nm are collected at one second intervals for the SureStep® at a temperature ranging from 15 to 35 ℃. 7개의 생산 롯으로부터의 스트립을 사용하고, 대략 표준인 적혈구 용량에서 스파이킹된(의도하는 글루코스 농도를 갖는) 전혈로 전개된다. Use a strip of from seven production blots, and is deployed by (having the intended glucose concentration) in the spiked red cell capacity is approximately normal whole blood. 4가지 혈액 샘플이 각각의 온도에 대해 사용된다. 4 of blood samples is used for each temperature. 계획된 종료점의 선언에 사용되는 항목은 (1) 반응이 50% 이상 종결된다는 것과 (2) 3개의 연속 K/S 추정치가 평균 K/S의 2% 이상의 범위를 갖는다는 것이다. Also used for declaring the planned end point is that (1) the reaction was concluded as being more than 50% (2) three successive K / S estimates have a range of more than 2% of the average K / S. 이들 항목은 표준 SureStep® 종료점(5초 내의 1% 변화)이 달성되기 전에 만족되지 않는 경우, SureStep® 종료점을 사용한다. If these items are not satisfied before the (1% change in 5 seconds) standard SureStep® endpoint is achieved, it uses SureStep® endpoint. 글루코스는 K/S 및 글루코스 사이의 SureStep® 관계에 따라 계산한다. Glucose is calculated according to the SureStep® relationship between K / S and glucose. SureStep® 종료점 값이 새로운 연산 결과와 비교된다. The SureStep® endpoint value is compared to the new calculation results. 각각의 온도에서, 최적 Δt를 SureStep®과 당해 연산 사이의 평방 제곱근(RMS) 차이와, 관찰되는 평균 종료 시간의 단축의 조합을 기준으로 하여 측정한다. At each temperature is measured by an optimum Δt, based on the square root (RMS) of the difference between a combination and a reduction in the average exit time observed between the SureStep® art operation. 표 1에서 데이터는 종료 시간이 개선되고, 2개의 연산 결과 사이의 전형적인 불일치가 적음을 나타낸다. In Table 1, data is to improve the end time, indicates that the typical mismatch between the two operational result less. 본 발명에 따르는 반응 종료점을 특성화하는 방법은 의학 진단 검정을 용이하게 하고 이러한 검정을 수행하는 데 소요되는 시간을 단축시킬 수 있으며, 환자 또는 일반인에 의해 임상적 설정의 외부에서 통상적으로 수행되는 혈당치 모니터링 및 항응고제 요법 모니터링과 같은 의학 진단 시험에 특히 유용하다. To characterize the reaction end point according to the invention are blood glucose monitoring that facilitate medical diagnostic assays, and, and these may shorten the time required to perform the test, typically performed by the patient or the public from the outside of the clinical setting and it is particularly useful in medical diagnostic tests such as anticoagulant therapy monitoring. 본 발명은 이의 특정 양태에 대해 기술되었으나, 당해 분야의 숙련가들은 다양한 변화 및 등가물에 의한 대체가 본 발명의 요지 및 범주를 벗어나지 않으면서 이루어질 수 있음을 이해할 것이다. Although the invention has been described with respect to specific embodiments thereof, it will be appreciated that those skilled in the art is replaced by a variety of changes, and equivalents may be made without departing from the spirit and scope of the invention. 또한, 다수의 수정은 특정 상황, 재료, 물질의 조성, 공정, 공정 단계(들)을 본 발명의 목적, 요지 및 범주에 맞출 수 있다. In addition, many modifications may be adapted to the object of the composition of a particular situation, material, substance, process, process step (s) invention, the spirit and scope. 이러한 모든 변형은 첨부된 청구범위 내에서 이루어진다. All such modifications are made within the scope of the appended claims. 상기 측정치 A 1 , A 2 및 A 3 으로부터 수학식 1에 따라 관찰 가능한 표지에 대한 종료점 값 A ∞ 를 측정하는 단계(c)를 포함하는, 진단 검정 장치의 반응 종료점 특성화 방법. The measurement A 1, A 2 and A 3 from the process reaction end point characterization of the diagnostic test device, comprising a step (c) for measuring the end point value A ∞ on the available labeling observation according to equation (1). 제1항에 있어서, 상기 관찰 가능한 표지가 상기 화학 반응과 관련된 광학적으로 검출 가능한 화학종을 포함하는, 진단 검정 장치의 반응 종료점 특성화 방법. The method of claim 1, wherein the reaction end point characterization method of the observation diagnostic test device, which contains the optically detectable species as the cover is associated with the chemical reaction possible. 제1항에 있어서, 상기 관찰 가능한 표지가 상기 화학 반응과 관련된 전기적으로 검출 가능한 화학종을 포함하는, 진단 검정 장치의 반응 종료점 특성화 방법. The method of claim 1, wherein the reaction end point characterization method of the observation diagnostic test device, which includes an electrically detectable species associated with said chemical reaction is to cover possible. 상기 측정치 A 1 , A 2 및 A 3 으로부터 수학식 1에 따라 관찰 가능한 표지에 대한 종료점 값 A ∞ 를 측정할 수 있는 저장된 프로그램(b)을 포함하는, 반응 종료점 특성화용 시스템. The measurement A 1, A 2 and A 3 from the reaction end point systems for characterization including a program (b) is stored, which can measure the end point value A ∞ for observable cover according to equation (1). 제6항에 있어서, 상기 관찰 가능한 표지가 상기 화학 반응과 관련된 광학적으로 검출 가능한 화학종을 포함하는, 반응 종료점 특성화용 시스템. Claim 6, optical, and the reaction end point system for characterizing, including a detectable species by the observation related to the possible cover the chemical reaction. 제6항에 있어서, 상기 관찰 가능한 표지가 상기 화학 반응과 관련된 전기적으로 검출 가능한 화학종을 포함하는, 반응 종료점 특성화용 시스템. Claim 6, the observable for the system, the reaction end point characterization, including electrically detectable species associated with said chemical reaction with the labeled. 제1항에 있어서, 상기 화학 반응이 산화 가능한 염료와의 반응을 포함하는, 진단 검정 장치의 반응 종료점 특성화 방법. The method of claim 1, wherein the reaction end point characterization method of diagnostic test devices, in which the chemical reaction comprises the reaction of the oxidizable dye. 제1항에 있어서, 상기 화학 반응이 체액으로부터 수득된 분석물(analyte)을 포함하는, 진단 검정 장치의 반응 종료점 특성화 방법. The method of claim 1, wherein the reaction end point characterization method of diagnostic test devices, the chemical reaction, including the analyte (analyte) obtained from the body fluid. 제12항에 있어서, 상기 관찰 가능한 표지가 반응 샘플 내의 상기 분석물의 농도와 관련되는 표지인, 진단 검정 장치의 반응 종료점 특성화 방법. The method of claim 12, wherein the reaction end point characterization method of the observation marker, a diagnostic test device, the cover, which is related to the concentration of the analyte in the reaction samples as possible. 제1항에 있어서, 상기 단계(b)가 제1 관찰 과정 동안 상기 관찰 가능한 표지에 대해 제1 세트의 측정치 A 1 , A 2 및 A 3 을 측정하는 단계(b1), 및 제2 관찰 과정 동안 상기 관찰 가능한 표지에 대해 제2 세트의 측정치 A 1 , A 2 및 A 3 을 측정하는 단계(b2)를 포함하는, 진단 검정 장치의 반응 종료점 특성화 방법. The method of claim 1, wherein during said step (b) the first observation process the observation measurements of the first set for the available labeled A 1, A 2, and step (b1), and the second observation the measuring of A 3 for the observed measurement of the second set for the available labeled a 1, a 2 and a reaction end point characterization method of diagnostic test devices, comprising the step (b2) of measuring the three. 상기 제1 종료점 값과 상기 제2 종료점 값으로부터 종료점 값의 차이를 측정하는 단계(d)를 포함하는, 진단 검정 장치의 반응 종료점 특성화 방법. The reaction end point characterization method of the first end point value A and the second comprising the step (d) measuring a difference in end point value from the end point value, the diagnostic test device. 상기 제1, 제2 및 제n 종료점 값들이 수렴하는 경우, 이를 측정하는 단계(dn)를 추가로 포함하는, 진단 검정 장치의 반응 종료점 특성화 방법. It said first, second and n if the end point values ​​are converging, and the reaction end point characterization method of diagnostic test devices, further including the step (dn) to measure them. 제6항에 있어서, 상기 화학 반응이 산화 가능한 염료와의 반응을 포함하는, 반응 종료점 특성화용 시스템. Claim 6, the reaction end point system for a characterization comprising the reaction of the chemical reaction with the oxidizable dye in. 제6항에 있어서, 상기 화학 반응이 체액으로부터 수득된 분석물을 포함하는, 반응 종료점 특성화용 시스템. The method of claim 6 wherein the reaction end point system for characterizing, including the analyte to give the chemical reaction from the body fluid. 제18항에 있어서, 상기 관찰 가능한 표지가 반응 샘플 내의 상기 분석물의 농도와 관련되는 표지인, 반응 종료점 특성화용 시스템. Of claim 18 wherein the cover is observable in the reaction end point system for characterizing the cover according to the concentration of the analyte in the sample to the reaction. 제6항에 있어서, 제1 세트의 측정치 A 1 , A 2 및 A 3 을 입력할 수 있는 저장된 프로그램(a1), 및 제2 세트의 측정치 A 1 , A 2 및 A 3 을 입력할 수 있는 저장된 프로그램(a2)를 추가로 포함하는, 반응 종료점 특성화용 시스템. 7. The method of claim 6, stored in the measured values A 1, A 2 and A 3 of a stored program (a1), and the second set to enter the measurement A 1, A 2 and A 3 in the first set can be entered program, the reaction end point system for characterizing further comprising the (a2). 제20항에 있어서, 상기 제1 세트의 측정치 A 1 , A 2 및 A 3 로부터 제1 종료점 값을 측정할 수 있는 저장된 프로그램(b1), 및 제2 세트의 측정치 A 1 , A 2 및 A 3 로부터 제2 종료점 값을 측정할 수 있는 저장된 프로그램(b2)을 추가로 포함하는, 반응 종료점 특성화용 시스템. The method of claim 20, wherein the measure of the first set A 1, A 2 and A 3 from the stored to measure the first end point value A program (b1), and the measured values of the second set A 1, A 2 and A 3 system, the reaction end point characterization comprising from further stored program (b2) capable of measuring a second end point value. 상기 제1, 제2 및 제n 종료점 값들이 수렴하는 경우, 이를 입력할 수 있는 저장된 프로그램(c)를 추가로 포함하는, 반응 종료점 특성화용 시스템. The first, the second and the n values ​​are the endpoint if the convergence, the reaction end point systems for characterization including the same further stored program (c) that can be entered. BRPI0914018A2 (en) * 2008-10-16 2015-10-27 Konink Philips Elecronics N V "Method for determining the amount of a target component in a sample, the sensor device, computer program product and device using the sensor"
Byrne et al. 2000 Evaluation of an electrochemical sensor for measuring blood ketones. Fraser et al. 1993 Desirable standards for laboratory tests if they are to fulfill medical needs.